After traveling in Europe non-stop for two months, moving from one city to another every few days, I decided to find a place to stay for a while and HelpX popped up in my mind. I’ve heard it from a friend of mine but never tried it. I knew I would have to do it in the UK due to visa restriction and I would prefer to stay in Wales as I had been to England, Scotland and North Ireland already. 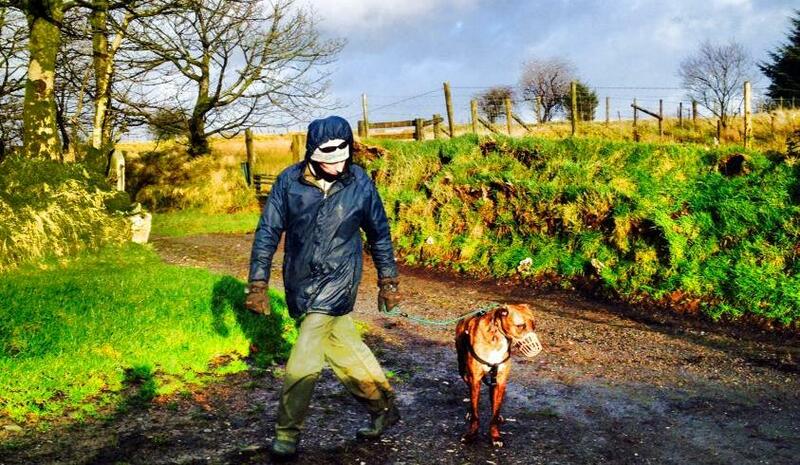 So I looked through the host pages in Wales on Helpx and a dog trainer Terry caught my eyes immediately. He was looking for a helper to clean kennels and walk the dogs. The pictures of him and his pack – Alaskan Malamutes and border collie are amazing so that I wrote him an email together with a pic of me and my dog. Terry replied my email quickly and accepted my request. I felt so lucky and grateful that he welcomed me to his home because this was my very first Helpx experience and I didn’t even have a review on my profile! I finally arrived in Cwmduad, Carmarthen, Wales after changing three trains and one bus from Oxford. I didn’t even know how to pronounce Cwmduad before I arrived. Terry picked me up at the bus station and then drove me to the farm. Wow, he lives in the middle of nowhere! The nearest neighbour lives 5-min driving away. It is an absolutely new life style to me. Raised and grew up in downtown Shanghai, I have never thought one day I would have a chance to experience living like a country girl. Terry briefly showed me around. I had my own bedroom and a shared bathroom. He said we needed to be as eco-friendly as we could when living in the countryside. I have to admit that as a city girl, sometimes I take things for granted because everything is ready to get in 2 minutes. 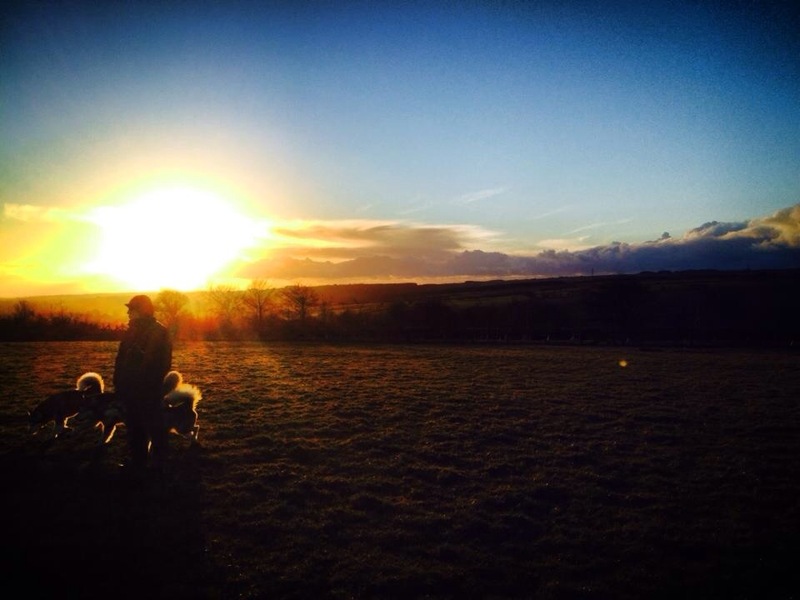 Living on the farm offered me an opportunity to be close to the nature and change some of my living habits. But hey! We’ve got wifi and fast board band in the house on the farm! 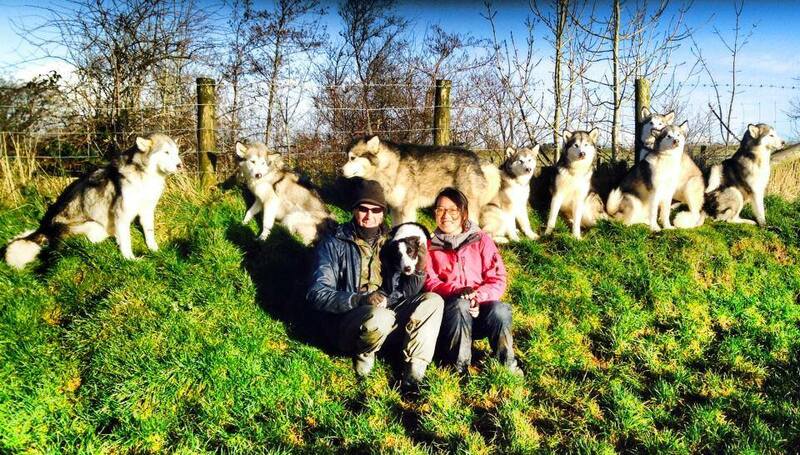 There are nine dogs in Terry’s kennels: 8 Alaskan Malamutes – Nika, Luna, Bodi, Chi’ka, Tico, Vega, Juno and Bini, and one border collie Rock. They are all well trained and gorgeous. Terry suggested that I should act cool when I first saw them, otherwise they would want to dominate me later. So, no eye contacts at first! They were indeed very excited and curious to see me the first time, sniffing me all over. Tico, the only male adult malamute even jumped to me and kissed me right on my lips! Here is my daily routine: left the house at 9 AM, fed the birds, then fed the dogs, cleaned their beds and changed water while they enjoyed their food. I picked their poos to the bucket and then found where they peed and cleared it up. It sounds easy but you have to be a dog lover to do this or you will be complaining all the time. I don’t think I should say I ENJOY picking up dogs’ poos everyday, but I’m willing to do that because I love dogs. After that, I walked them one by one. I have a small dog back in Shanghai but I didn’t have experience walking big dogs at all. Terry asked me to walk them one by one in the first week, and then I started to walk them two at a time in the next 2 weeks. 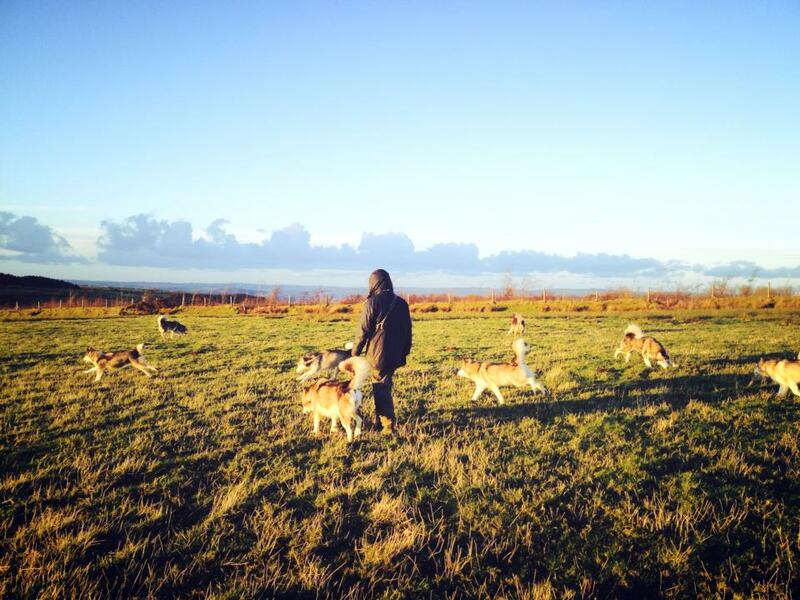 That was the moment when I felt like I was walking the pack and they actually listened to me. I had a lunch break after I finished my morning work at 11.30 AM. In late afternoon, usually at 3 PM, Terry and I walked the pack together. We walked 9 of them at one time. It’s amazing to see how well behaved they were when Terry walked them. 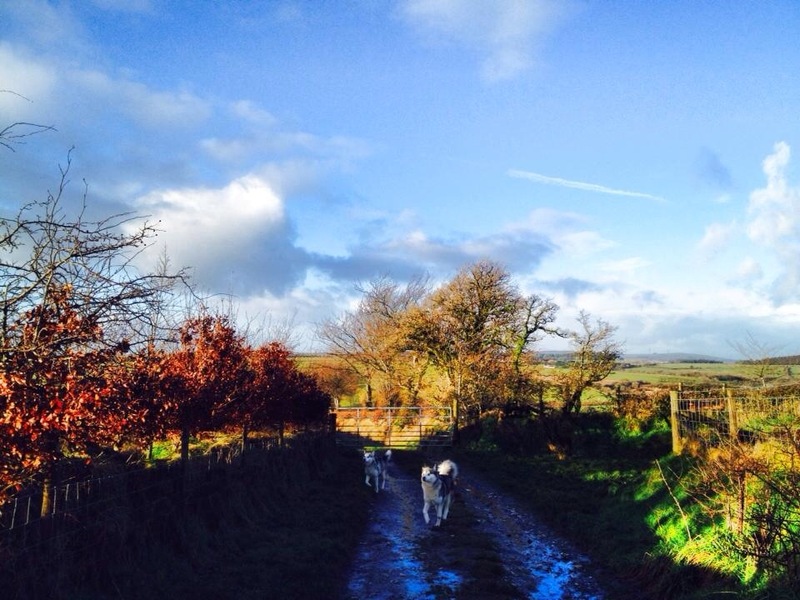 When the weather was nice, Terry would let the dogs run on the farm. They looked so happy to chase each other, however no one could follow up Rock, the only border collie, as he runs way too fast than the malamutes! At 10 PM, we needed to let the dogs out again to have a quick pee or poo so that they wouldn’t mess up the beds over the night. They said good night to us with their wolf-like barking every night after we got to the house. 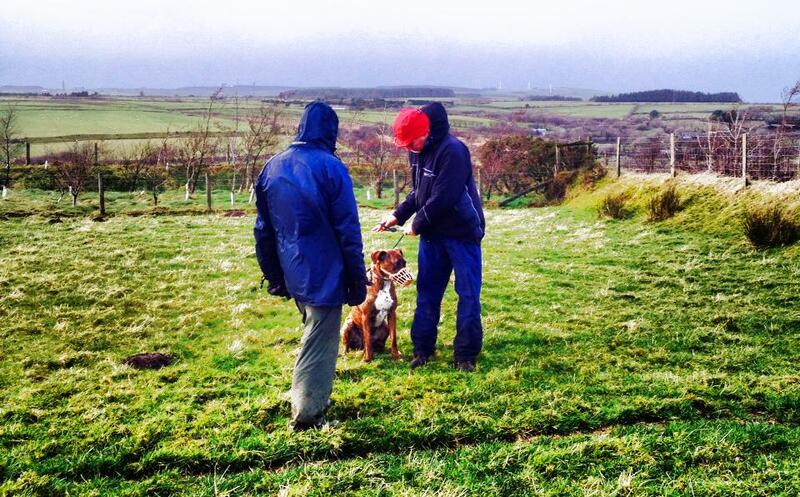 Terry is an experienced and respectful dog trainer in the UK. He has won many prizes in various kinds of dog competitions. He shared that he loves dogs and he was born with a skill of communicating with dogs. He is originally from London, but he moved to Wales 15 years ago after travelling in Europe and Asia. 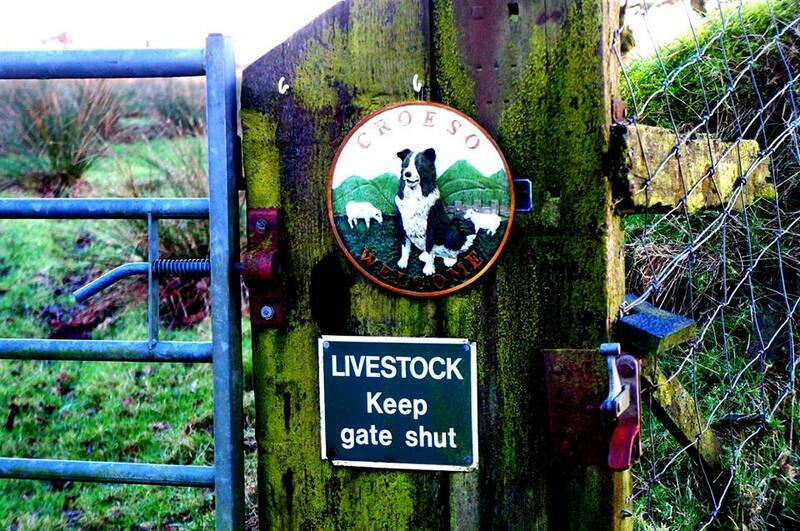 He bought this 400-year-old house in Cwmduad and built the kennels on his own. He spends most of the time in taking care of the dogs, participating in dog competitions or shows and giving dog training lessons. He also sells malamutes and people line up to buy his puppies as all of his malamutes are well behaved after he trains them. During my stay, I met two of his former buyers – Anna and Caroline, who are now good friends with Terry. 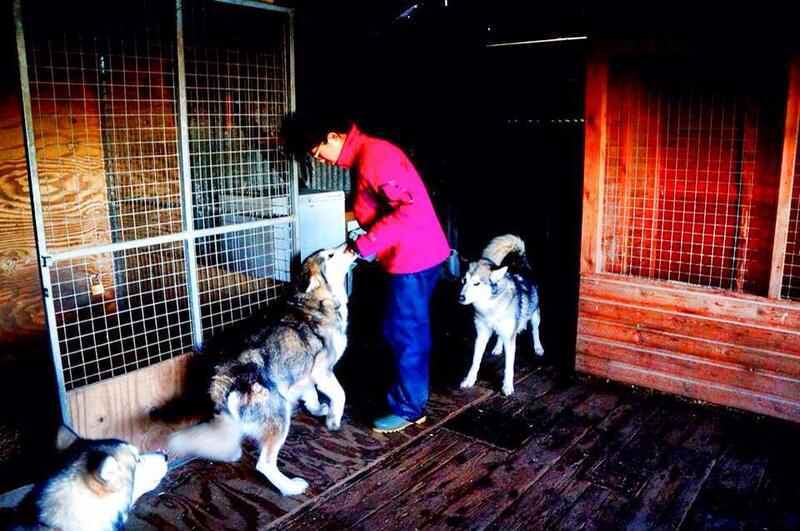 They come visit Terry and the pack regularly. Caroline brings Terry homemade fresh food and helps him clean the kennels and walks the dogs every two weeks so that he can have a day off. Before I left the farm, another volunteer Chrissy took over the job and she had stayed with Terry and the pack same time last year already! How amazing to see that dogs bring people together and make our relationship closer than ever! My parents and I have made a lot of new friends when we walk our dog. We would never talk with these strangers before we adopted her. It was lucky for me to watch 3 different kinds of dog training lessons when I was there. The most impressive lesson was to train a pitbull who bites people and eats sheep. 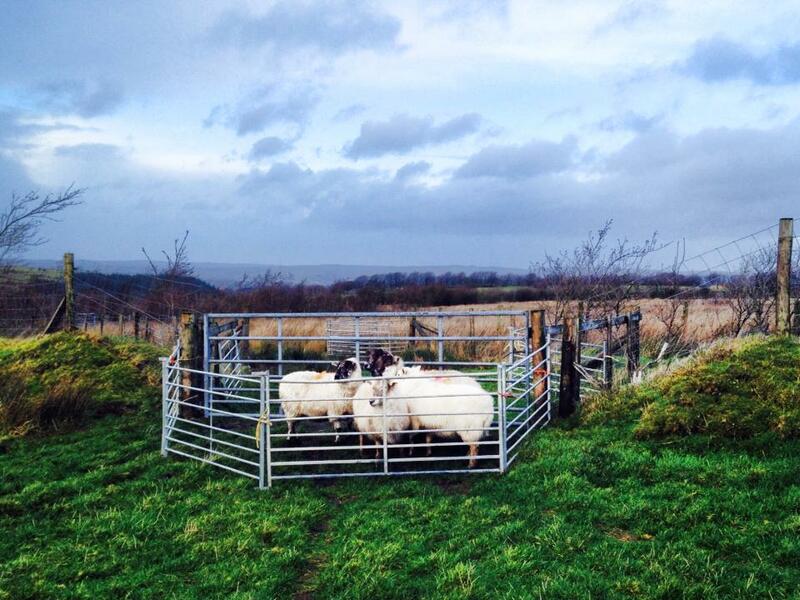 Terry had to take Rock to move the sheep from one side of the hill to another in bad weather. We wanted to see how the pitbull would react with the sheep after the lesson. The pitbull Bryn was very nervous. He was shaking the whole time. I’ve never seen such a nervous dog in my life. He doesn’t trust human at all as he might be amused by people before. Basically he dragged his owner Paul around and Paul just couldn’t control him at all. Terry put a muzzle on him when training as a nervous dog is very dangerous. When they do bad or nervous stuff, we shouldn’t encourage them by saying “it’s alright, good boy/girl”. It’s a typical human thing to think that dogs need reassurance because if a child does that, he or she would need reassurance, but dogs don’t. We should stop them right away by saying “stop it”. The biggest problem is that, like other dog owners who fail to control their dogs, Paul doesn’t know how to be the pack leader. When humans are not acting like the leaders, dogs consciously want to dominate which leads to being aggressive or nervous. Bryn doesn’t want to dominate at all. Instead, he just wants to be a dog and relax. But he feels like he has to as his owner doesn’t know how to protect him and control the situation. That’s why he gets so nervous because basically he is forced to do something he doesn’t intend to do. When he gets nervous, everything could happen. He bites sheep because there are sheep on their farm. If they farm chickens, he would probably eat chickens as well. Anyways, the training course was successful as always. Bryn was able to sit tight in front of the sheep and stopped shaking. 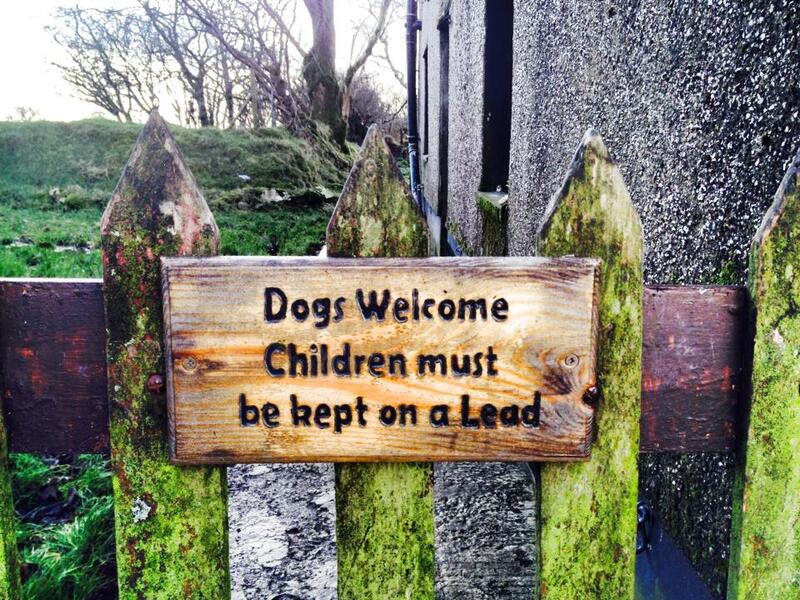 It only took Terry a while to train and fix the dogs, but it takes ages to train the owners how to train the dogs. All worked pretty well and they seemed happy and obedient when I walked them on the track. I couldn’t help but to reflect the ways I’ve treated my dog back in Shanghai. I thought I adopted her, gave her a family, provided her food and walked her every day, naturally, she should see me as her owner. After staying on the farm with Terry and the dogs, I realized I misunderstood what a pack leader really is. It’s not an easy job at all. 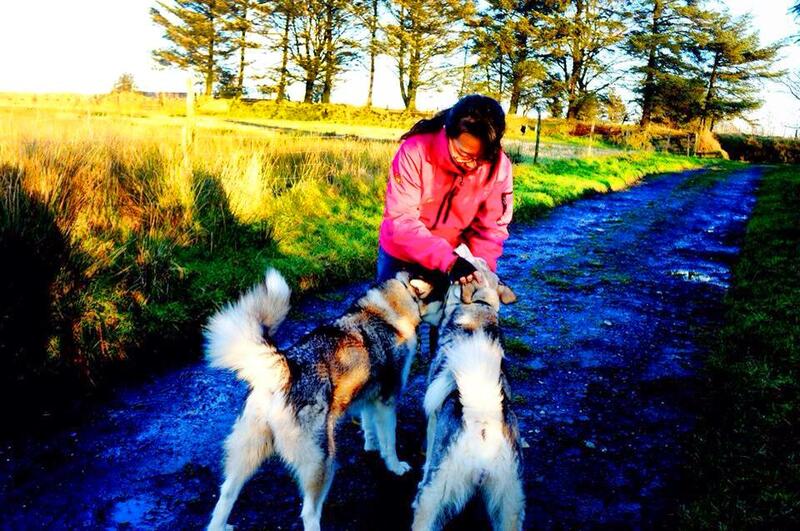 The primary value of my stay on the farm was to learn how to handle dogs and be a real pack leader. Many dog owners don’t really understand dogs. Yes, dogs are our best friends and we like to treat them as our family member, but before that, we need to treat them as dogs. It’s usually the owner’s fault when a dog makes mistake. It’s our job to train them and correct them. I’m very grateful that I got the opportunity to live with Terry and the pack for a while. After I got back to Shanghai, I’ve taught my dog not to pull me around when I walk her and wait politely when I feed her. She’s making progress and I can tell she is happier than ever before. Thank you Terry for the amazing lessons!